Author Mariam Gates attends the Girl Powerful Leadership Summit at Grace Farms in New Canaan on Nov. 6. Silvermine Arts Center announced new leadership with the creation of the Office of the Chair led by Board Chair Rose-Marie Fox. The Office of the Chair is being created to enhance Silvermine’s ability to support its growth and strategic initiatives as it nears its centennial, while continuing to carefully manage the operations and financial performance. Two executives will join Rose-Marie — strategy and development Director Robin Jaffee Frank, finance and operations Director Barbara Linarducci. Together, Frank and Linarducci will serve as vice chair on the board of rrustees. Frank previously served as chief curator at the Wadsworth Atheneum Museum of Art, and curator at the Yale University Art Gallery. She has organized exhibitions, lectured, and published widely on American visual culture from the colonial to contemporary periods. Linarducci joined Silvermine in 2011 after a distinguished career in the technology industry, where she held senior management positions at Lucent, Avaya and Kronos. William Hilson, an entrepreneur in design and technology and an adjunct professor at Pratt Institute’s Graduate Communications Design Department. Stephanie Joyce, a professional artist exhibiting work in New York and Europe. Robert E. Mallozzi III, the former three-term first selectman and chairman of the Board of Finance for the town of New Canaan. Roger Mudre, a professional artist and director of Silvermine Gallery. He serves as Co-Chair of the Guild. Grace Tang, the senior audit partner for PwC in China. She serves on the board of partners of PwC China, Hong Kong, Taiwan, and Singapore. Tang will serve as treasurer. 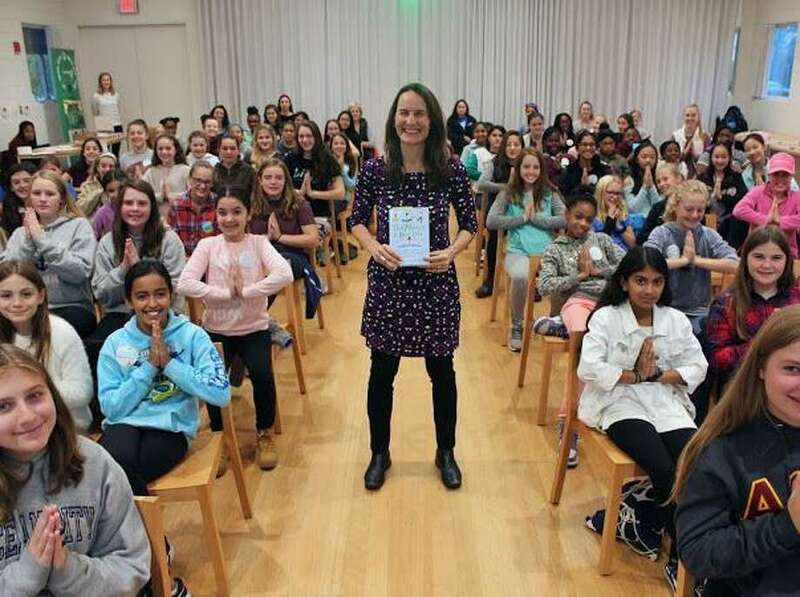 Grace Farms was the venue for LiveGirl’s “Girl Powerful” Leadership Summit on Election Day, which brought together 100 middle school girls from across Fairfield County. The summit included speakers, workshops, and team-building designed to help girls discover their inner powers. Reena Ruparelia, a Dove Real Beauty ambassador, led a workshop on body positivity. She shared her story of living with psoriasis, a chronic skin condition, and said, “Girls, please remember that your body is your friend, not your enemy. Love your body and take care of it.” The League of Women Voters also led a workshop educating the girls on the importance of voting and civic engagement. LiveGirl is a nonprofit organization that provides year-round leadership development and mentoring for girls. For information, visit www.goLiveGirl.org or email info@goLiveGirl.org. The 15th annual New Canaan Turkey Trot will take place Nov. 18 at 11:30 a.m. The 5K run/walk begins and ends at Waveny Park on South Avenue in New Canaan. Proceeds from the race benefit Open Doors, which provides supportive housing and emergency shelter to those in need in the area, and over 30,000 meals every month to people struggling to make ends meet. Organized by a team of New Canaan and Weston students, the event provides funds over the busy holiday season. This year’s event is co-chaired by Brielle Connelly and David Tamburri along with committee members Meghan Griffiths, Kaleigh Griffiths, Richard Hernandez, Katie Libman, Caroline Pellegrino, Katherine Pellegrino, Zach Tamburri, and Baily Williams. The Turkey Trot has grown to about 500 runners each year, and over the past five years the race has resulted in over $100,000 in combined donations for Open Doors. This year’s race sponsors include: Building and Land Technology, Hospital for Special Surgery Stamford, Hotel Zero Degrees, JoyRide Cycling Studio, Millennium, and New Balance New Canaan. There are still opportunities to donate and be included as a sponsor for the event. Race-day registration opens at 10:30 a.m. and the race starts at 11:30 a.m. The event registration fee is $30 in advance. Students are selling Turkey Trot shirts and hats, and any small donations are also welcome. The walk and run will take place rain or shine. Students can use this event to earn community service hours. Clothing donations are also being accepted, including adults’ and children’s coats, gloves, hats, scarves, and blankets. To register online, visit runsignup.com/Race/Events/CT/NewCanaan/NewCanaanTurkeyTrot. Donatoins can also be made by making a check payable to Open Doors and send to 4 Merritt St., Norwalk, CT 06854 or visit weblink.donorperfect.com/NewCanaanTurkeyTrot.